My wife had the day off work today so I thought I'd drive out to Lake Camanche and give her some time at the house by herself. I got to the lake at 8:15, parked out at the point where I usually fish and put out two lines with rainbow PB. Somewhere between then and about 11:00 I got, either a couple hits I missed or fish hitting the line on the way by. In either event, nothing stayed hooked. So I sat and sat and sat and finally decided to go further out on the ever widening peninsula. I tried one rod with rainbow PB & a little Pro Cure Garlic and one rod with rainbow PB & a little Pro Cure Trophy Trout (one can hope after all) on the other. Then I reeled in one line and started throwing Kastmasters. Now, I don't know what they want this year. For the last six years or so, it's been something different every year. For the last two, it's been silver. Before that, pink was hot for about four years. If you've been following this blog, you know that already. So this morning I started with silver. Then progressed as follows: gold, pink, green/silver, blue silver. 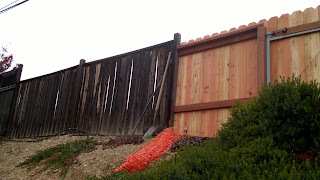 Did I mention I finished the replacement of the fence in back? This is the final product. Sorry, I didn't realize I didn't have a day time picture. Just took the one below. It's just after 5:00 and dark already. If you want to see a daytime photo, let me know. OK, back to fishing. Holographic (that's a Kastmaster color), silver/orange, and finally Brown Trout color. The last one was what brought this little Rainbow to hand. I put him in a little pond on the edge of the lake for a photo and then shooed him back into the lake for another day. Wasn't big enough to make a dinner. On the other hand, it was big enough to do away with the skunk. That was it. They have been stocking like crazy, in fact they stocked yesterday for the holiday weekend, I think that until the lake turns over, fishing with be spotty at best. So that's it for this trip. After a little cleanup of the area behind the fence and a trip to the dump on Friday the next project with begin. Mark I tie a few flies using holographic tinsel for the body. They produce.